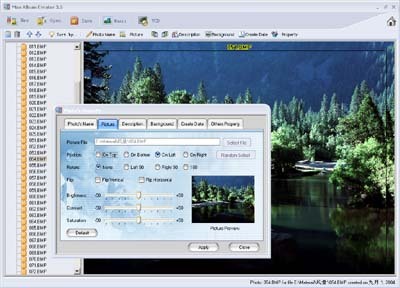 Max Album Creator was designed to create the Video CD, Super Video CD and the Mpeg file with Mpeg-1/2 for your photos. You can use this software to organise your photos in your computer to a album. Then you can add name, description, backgournd, created date to each of photo and adjust your pictures in easy way. To output the album, you can choose VCD, SVCD, MPEG file to be created. Max Album Creator is a powerful, splendid and simple to use application for organise and promulgate your photos. Organise your photos in easy way. Add description for each photo. Edit picture's property. Create VCD/SVCD for your album. Create Mpeg file for your album.